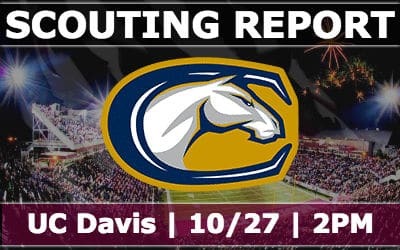 After a week of rest the Griz return home in need of a rebound win, but coming to visit is the current #1 team in the conference, the UC Davis Aggies. UCD has an FBS win under their belt and has not lost a conference game yet. They’re a team loaded with talent at skill positions and seem to be that one team each year that rises out of the pack to contend for the conference, while all of the more traditional powers either remain down or just keep beating each other. This is, by far, the toughest team the Griz will have faced this season. 44-38 win vs San Jose State: The score suggests a shootout, and it was a high scoring affair, but UCD lead the game most of the day. The only lead SJSU had was 14-7 with 2:20 left in the first quarter which UCD tied right back up in about 2:30 of clock. From there UCD held leads of 28-14, 37-21, and 44-31. SJSU set the final score with less than 2:00 to go but couldn’t get the onside kick and UCD kneeled out the clock. Davis had about 450 passing and 150 rushing, while SJSU had about 360 passing and 140 rushing. One thing that really hurt UCD was 3 lost turnovers. 54-21 win vs San Diego: The final score shows a blowout win, but it really wasn’t that way until late. Scoring was super weird in this one. UCD jumps up 20-0 at the half, it would seem the rout is on. But in the 3rd SD scores 21 unanswered to take the lead. That… woke UCD up, they score 5 TDs on consecutive possessions to put the game away. San Diego had about 300 passing, neither team rushed for much, UCD passed for nearly 400. 10-30 loss @ Stanford: Well… duh, it’s Stanford. UCD did lead 3-0 through the whole first quarter though. Davis held Stanford to just 351 yards of offense, while amassing 309 themselves. Both teams had 2 interceptions thrown. 44-21 win vs Idaho: This one was a blowout, UCD had a 44-7 lead going into the 4th quarter. Davis was perfectly balanced with 256 rushing and 256 passing. Idaho had about 120 rushing and almost 300 passing, considering they were behind the whole way, makes sense they’d pass a lot more. 49-36 win @ UNC: This one had the crazy backdoor point cover. UCD was up 49-10 with 7 minutes left in the game. UNC rattles off 26 late points and covers the point spread in doing so. Both teams made money passing the ball, 408 for Davis and 386 for UNC. UNC killed themselves with 3 turnovers. 44-37 win @ ISU: In a primetime battle for first place in the Big Sky two of the best offenses with statistically the two best QBs lit up the scoreboard as UCD completed a pretty big comeback win to down ISU. ISU opened up the game with a great start, scoring 4 times in a row to open up a 23-7 lead on UCD. The game was 23-14 at the half, and ISU added an early TD to go up 30-14. UCD responded with a TD and a successful 2-point conversion to make it a 1-score game, 30-22. ISU answered with another TD, now 37-22 with about 13:30 to go in the game. From there though… UCD roared back. UCD replied with a TD to make it 37-29, stopped ISU a few times on 3 and outs, and then scored again with 1:09 to go AND got the 2 point conversion to tie it up. ISU should have won this game though, they went right down the field but missed a would-be game winner from 27 yards out. In OT UCD went for it on 4th and goal to score a TD and take the lead… ISU went 4 and out to lose the game. ISU out-gained UCD barely by 30 more yards (562 to 532). ISU’s attack was really balanced and it would seem UCD for once had a hard time containing both aspects of an offense. ISU had 243 on the ground and 319 passing. Meanwhile UCD had 150 rushing and 382 passing. As best I can tell this was the only game UCD had a negative turnover margin too. 52-10 win vs Cal Poly: If there was any letdown after a big win, it was just for 1 quarter. Poly was up 10-0 after 3 consecutive Davis 3 and outs. From there though… all Davis, 52 unanswered and 31 of which came in the 2nd quarter. Montana adds 3 on special teams stats, UCD adds 7, 1 more for push. That puts it at 10 for UCD, 5 for Montana, 2 for push. #15 Jake Maier, QB: Jake won newcomer of the year last year and now in his junior season (transferred from Long Beach City College) is the best QB (statistically) in the Big Sky. While Cookus and Gubrud have missed games due to injury I would surmise the conference MVP race is between Maier and Gueller at ISU. This year Maier is passing for almost 310 yards per game and has 21 passing TDs to just 3 interceptions. #3 Keelan Doss, WR: Doss is the real deal, a 6-3, 209 pound WR who is currently ranked as the 20th best WR NFL prospect in the 2019 NFL draft. This season Doss’s stats aren’t as eye-popping as they were last season. He’s got almost 600 yards receiving and 4 TDs. Last season he finished with 1499 yards and 7 TDs. This guy is a legit #1 WR and my guess is the reason his stats have reduced is that UCD has added/cultivated more talent across their offense to spread the ball out. While Doss’s bulk numbers aren’t as big his catch total is 30 more than Harrell, the #2 WR in the system (61 catches to Harrell’s 31). #40 Ulonzo Gilliam, RB: Gilliam has exploded on the scene as an RS-frosh for UCD. He’s on the Jerry Rice list nationally and has helped to make UCD’s offense more diverse in the way it can attack defenses. He got 512 rushing yards (73 per game) and 240 receiving yards (35 per game) and a Big Sky-best 12 total TDs scored (8 rushing, 4 receiving). #2 Jared Harrell, WR: The 6-2, 200 pound sophomore has really reaped the benefits of Doss drawing the #1 corner. He’s got about 500 yards and 4 TDs receiving this season so far. #87 Wesley Preece, TE: A red zone nightmare for defenses, last year was 3rd team all conference. A 6-5, 240 pound TE he’s got 181 yards receiving, which doesn’t sound like much but it’s on 15 total catches, he’s averaging over 12 yards per catch, and has 6 TDs already. #34 Mason Moe, OLB: A 6-0, 235 pound outside linebacker Moe is tied for 2nd in the Big Sky with Dante Olson for total sacks with 5. He’s got 10 TFLs this season, 2 interceptions, and 1 fumble recovery. #20 Vincent White, S: Listed as a corner on the roster but appears to be playing safety. He’s got 28 tackles (the team highest is 32) but has a Big Sky-best 13 pass breakups, he’s also got 1 INT and 1 forced fumble. #55 Montell Bland, LB: Bland leads UCD in tackles, with 32, this team really spreads defensive stats around. He’s got 3 TFLs, 1 sack, and 1 fumble recovery. 1. Score early, score often, don’t let up. I think the Griz will need more than 40 points to win on Saturday. This will require good, quality drives where most come away with points, and if somehow we hold a 2(ish) score lead like ISU did… don’t take our foot off the gas and keep pressing. 2. Pressure Maier. Our secondary is too young and inexperienced to sit back and successfully cover such a skilled corps for more than a handful of seconds. I don’t think we can sit back in a max-cover set and hope/pray the DL can get to Maier. I think there needs to be lots of blitzes and pressure that forces quicker throws. Maier, Doss, Harrell, and Gilliam are going to get their stats, lets not let them sit back and pick us apart. 3. No damn turnovers lost. The Griz this season have won when they win the turnover battle and lose when they don’t. This is a tall order as UCD has one of the best turnover margins in the Big Sky and over the last two games the Griz have been very poor with ball security. 5. Don’t just rely on the passing game. What’s interesting is that most all teams have shown statistical success against UCD passing the ball. But one can point out that in many of those games those teams were down or in a shootout most of the time that required them to do so. ISU I think showed the right way to attack UCD and really should have won if not for a missed fieldgoal at the end of regulation. 6. The fans need to be in this game. I’m seeing suggestion that a ton of tickets are up for sale with no buyers. Obviously the fickle side of Griz Nation that easily could go to the game but are choosing not to just because of the last few weeks is showing up. Those in attendance need to rally the Griz in every way possible. 7. Keep Gilliam in check. I think Doss is going to get his stats and yards, especially against Nash, Calhoun, and Cowans. I think though that Gilliam would be the guy that possibly the defense could neutralize and make UCD a little more 1-dimensional. The Griz have moved from a 6 point underdog to an 8.5 point underdog in this game, which comes as no surprise to me. The stats, records, and results so far this season show why UCD is the favorite and there’s really not a lot of signs suggesting they should not keep rolling. I don’t know what to entirely suspect on Saturday. I do feel that this Griz team can be far better than what we’ve seen in the last two weeks, but we also certainly have seen what this team can produce when it doesn’t have much going its way either. Suffice to say that if the Griz team of the last two games shows up we will most certainly see the biggest blowout loss in the history Washington Grizzly Stadium. However, if we get a Griz team that’s successfully been able to examine and improve it’s shortcomings over the bye week and produce a team that’s a little closer to what we saw in the 1st half of the UNI game, the Sac St game, and the Cal Poly game. Then… suddenly I can see a huge upset happening. I feel that this coaching staff will have some tricks up their sleeves and with just 4 games left this season we may even see a few new names on the field here and there as well. On the GrizFan Podcast I picked a Griz win, mostly out of total homer/sugar coater fandom. I will say that if the Griz do pull off the huge upset it’ll be an insane game with a tremendously high score. Something like a 52-49 win. The more realistic side in me says to just pick UCD to win 49-20 though. Here’s to hoping my irrational fandom knows a little more this week!